I have very little idea how to actually write a book review. So little, in fact, that some (or most) would actually say no idea at all. With that being said let’s dive right in! 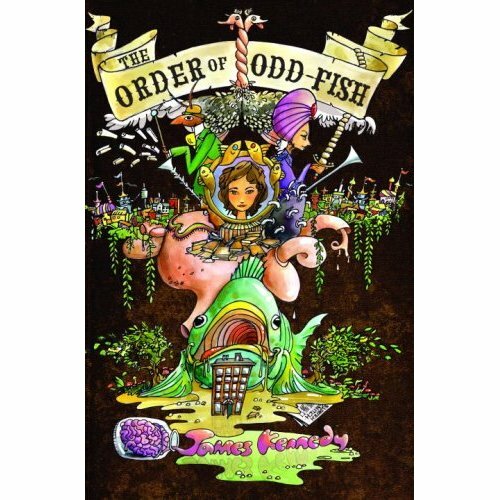 The Order of Odd-Fish, by James Kennedy, came out in 2008. I found it while browsing the young adult shelves in my local library and was drawn to the cover. Seriously. Look how awesome that cover art is. It reminds me a little of the illustrations from Norton Juster’s Phantom Tollbooth, and also of the Wayside School books. Anyways, the basic plot synopsis is that 13 year old Jo was found as a baby with a note saying she was dangerous, and has lived her entire life with an eccentric ex-actress aunt Lily in a secluded mansion, until a bunch of wild shenanigans go down at a Christmas party. They are joined by a giant ex-KGB colonel and a talking cockroach (neither of whom can remember the past 13 years, nor can Lily) and are brought to a bizarre city which is possibly in a different dimension? Turns out they are all part of the Knightly Order of Odd-Fish, who specialize in researching useless, misleading information for a non-existent encyclopaedia. Jo becomes a squire, has adventures around the city with some new friends, and finds out she’s a horrible monster who will destroy the world. Long story (some 400 pages, which is pretty massive for a children’s book) short, the world is not actually destroyed, and they mostly all live happily ever after. This book is weird, there is no doubt. But if you like bizarre, in the style of Roald Dahl, Monty Python (both referenced on the dust-jacket, and a contributing factor to my picking this up), Dr. Seuss, or say Lemony Snicket, than you might just quite enjoy this. I certainly did. There are some delightfully odd characters, like villain Ken Kiang who got into evil after growing bored of everything else; an amazing colourful world filled with thousands of strange gods and neighbourhoods; and a few ideas that strangely stick with you (like the idea that the world as we know it exists on the surface of a crumpled ball of paper). My favourite scene was definitely the part where some charmingly racist old-people mistook a giant talking cockroach for a Canadian and spent a couple pages berating him. I will say that one of my sticking points with the book is the age of the heroine. Jo is 13, and for the most part this has little to no effect on the plot, although having her take care of her elderly aunt, work a full-time job, and drive is a bit of a stretch. Romance is not a key plot point, and I’m totally okay with that. However, her eventual love interest in the book also attracts the attentions of a mob boss. I don’t think Ian’s age is ever mentioned, but one way of another there is an uncomfortable age gap thing going on there somewhere. Something that probably could have been avoided just by making Jo a few years older with no other changes.